I had mentioned in an earlier post that this tutorial promises to be an amazing one and so it was. Here is an outline of the workshop. Bernice E. Rogowitz covered fundamentals in human perception and cognition, and discussed how they apply to visualization. She covered a huge array of topics, ranging from the pupil being partially responsible for our depth perception, all the way to color theory and how it relates directly to the biology of the human eye. The presentation had a great flow, starting at a very high level to give everyone an idea of what questions they would be able to answer at the end. As the talk progressed, she covered detailed biological details of the human eye, and progressed to the intersection of perceptual issues and computer science. In the biological portion, we learned that there are five layers of cells in the retina, each responsible for different tasks. Much of the interesting stuff happens at the very beginning (photoreceptor distribution) and then further into the process at the ganglion cells. She went over how lateral inhibition is caused by the spatial distribution of the photoreceptors connected to a single ganglion cell, and how this is the reason for several of the optical illusions we perceive. She did a great job of explaining the connections between biology and perceptual issues. Cultural differences were also addressed. The eye movements we have are actually learned when we learn how to read. Cultures with different reading directions have substantially different reading directions. The section on the Striate Cortex was especially interesting. This is the first time in the visual system that images from each eye are merged (the point where depth perception occurs). This section sends output to 60% of the brain! This is a huge amount, and makes the visual system incredibly important to the decision making process. There are different response rates for different stimuli, how well do you want to convey magnitude information? Color and luminance mechanisms have different spatial sensitivities. Certain visual information is perceived “pre-attentively” such as color. How the world is perceived depends on what the user is trying to accomplish. These notes were transcribed by Lane Harrison (@laneharrison) and Drew Skau(@seeingstructure). They are both graduate students at UNCC. Thanks guys!! This is almost as good as being there. The annual IEEE Visualization, IEEE Information Visualization and IEEE Visual Analytics Science and Technology conferences – together known as IEEE Visweek will be held in Providence, RI from October 23rd to October 28th.The detailed conference program is spectacular and can be downloaded here.Some of the new events this year are under the Professional’s Compasscategory. It includes a Blind date lunch (where one can meet some researcher they have never met and learn about each others research), Meet the Editors (where one can meet editors from the top graphics and visualization journals), Lunch with the Leaders session (an opportunity to meet famous researchers in the field) and Meet the faculty/postdoc candidates (especially geared towards individuals looking for a postdoctoral position or a faculty position). I think this is an excellent idea and hope that the event is a hit at the conference.I am also eagerly looking forward towards the two collocated symposia – IEEE Biological Data Visualization (popularly known as biovis) and IEEE LDAV (Large data analysis and visualization). Their excellent programs are out and I’d encourage you to take a look at them. The tutorials this year look great and I am particularly looking forward to the tutorial on Perception and Cognition for Visualization, Visual Data Analysis and Computer Graphics by Bernice Rogowitz. Here is an outline for the tutorial that can be found on her website. She was one of the first people to recommend that people STOP using the rainbow color map. The telling stories with data workshop too looks great and will be a continuation of the great tutorial held by the same group last year. I am eagerly looking forward to it. Apart from this are the excellent papers that will be presented at the conference. I shall write another post about the ones I am particularly looking forward to. With so many exciting events going on, it almost seems like a crime to have all of them happening in the span of a few days. I shall definitely be blogging about the event as much as I can. You can also follow me on twitter, which will have more real time tweets than the blog which will distil a days worth of information into a post. Let me know if you are going to be around and I’ll be happy to talk to you. Data visualization is being used for detecting fraud, especially with respect to wire and credit card transactions. Work done at the Charlotte Visualization Center at UNC Charlotte provides some interesting insights into fraud detection. 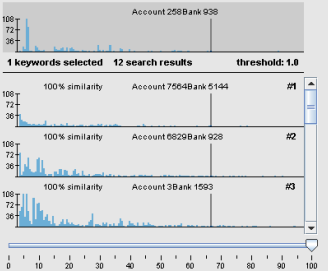 This work was conducted in collaboration with the Bank of America.In the following paper they highlight four visualization techniques that allow for fraud detection. Scalable and Interactive Visual Analysis of Financial Wire Transactions for Fraud Detection, Remco Chang, Alvin Lee, Mohammad Ghoniem, Robert Kosara, William Ribarsky, Jing Yang, Evan Suma, Caroline Ziemkiewicz, Daniel Kern, Agus Sudjianto, Journal of Information Visualization (IVS). Heatmap: A heatmap depicting the relationship between accounts and transactions. Search by example: Find accounts with transactions/activity similar to the current account being monitored. Strings and beads: A line graph based visualization that shows critical events as ‘beads’ on the graph. The use of a log scale for the y-axis is a neat idea and probably allows for improved exploration. 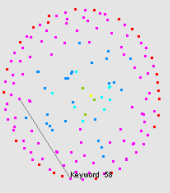 Keyword graph: A graph visualization showing keyword similarity This paper was based on previous work done by the same group titled Wirevis. I would encourage interested readers in reading the original paper as well as the previous paper (Wirevis). Centrifuge Systems, a Virginia based company, have developed data visualization software for fraud analysis. It is a web-based solution that allows interactive exploration of data for fraud detection. Can read a wide variety of file formats (excel/access databases). Allows interaction with visualizations such as node-link diagrams, bar charts etc. You can check out a 10-min video on their website at http://www.centrifugesystems.com/shadowbox/libraries/mediaplayer/Centrifuge-1.8-for-Banking-Fraud-Analysis.flv. As per the company website, it has been used to detect fraud in Bulgaria called the “Bulgarian Money Mule ring”. Seems like a step in the right direction. It would be interesting to see, if they could save and share workspaces for collaborative exploration of data. With their web-based framework, it would make it particularly interesting for investigators located at different locations to immediately access and interact with the current state of the visualization. Any other companies, products, research papers that you may have heard of that I missed? In this post, I focus on the use of visualization in conveying information regarding the environment, pollution, population effects on the planet and similar issues. The visualizations are particularly powerful and make us realize how much of an impact we have on the world. The Global Footprint Network is an amazing resource that provides information about our footprint on the planet. Other than the excellent scientific resources, they have a quiz that lets you know your carbon footprint at the end. The quiz can be taken at http://www.footprintnetwork.org/en/index.php/GFN/page/calculators/. Here’s a screenshot from the quiz which is really well done. The Visualization Sciences Group (The company that maintains OpenInventor among other things) has a video showing the amazing capabilities of their visualization software – Avizo Green. The video can be seen at http://www.mc3dviz.com/video/player.php?vfile=avizo/AVIZO_GREEN_mercury640x360.flv. Here is a screenshot from the amazing video. Hedgehogs when visualized over time convey the wind velocity so effectively. A research paper by Wood et al. discusses a web-based solution to visualize environmental data. The snapshot below shows a histogram View of Ozone from 3 sites in London – Jason Wood, Ken Brodlie and Helen Wright, Visualization over the World Wide Web and its application to environmental data, Proceedings of IEEE Visualization 1996 Conference, edited by R.Yagel and G.M. Nielson, pp 81–86, ACM Press. ISBN 0-89791-864-9. National Public Radio (NPR) had a very informative piece on Visualizing The U.S. Electric Grid – Here are some screenshots from the story. I wonder if they could have picked better visualizations to show the ‘sources of power’. It is a bit hard to visualize the differences in power generating capabilities of various states since the saturation is mapped to a value. Considering there are only a few different values, using different colors may have been a good idea. Any other thoughts on what they could have used to represent this data more effectively? Here’s another visual representation of the wind energy sources. What seemed most interesting to me is how much the US is dependent on coal power as compared to wind. I hope with the new administration’s initiatives for green energy, we will see a change in the near future. NY Times article discussing the growing interest in visualizing and drawing attention to the climate change problem through visualization. Climate Central is an accessible one-stop source for timely, relevant, high-quality climate information through a variety of channels, targeting the media and leaders in business, government, and religion. Have you seen any other visualization/website that has been used to communicate, inform, educate people about the issues surrounding environmental factors? If so, please feel free to add them in the comments section. The Eurovis 2009 conference concluded a few days ago in Berlin. Here are some of the papers that I found interesting. Links for all the papers are not available yet, but I shall update the post as and when I find them. Here is the whole list of accepted eurovis 2009 papers. Edward Grundy, Mark W. Jones, Robert S. Laramee, Rory P. Wilson and Emily L.C. Shepard – In this paper they present a unique way of visualization data obtained from sensors attached to animals as they move around the world. Animals such as the cormorant, sea turtles and such were tagged with tri axial accelerometers and tracked through time. Petra Isenberg and Danyel Fisher – In this paper they discuss a collaborative interface to interact with a collection of documents. The collaborative interface is called Cambiera and is a table top analytics tool. You can also see a video of users interacting with Cambiera on Youtube. Harald Sanftmann, Daniel Weiskopf – In this paper, the authors tackled an important and challenging problem of visualizing 3D scatterplots. 2D scatterplots are well known to convey data effectively. The use of illumination to better visualize the 3D nature of the data was a very elegant solution and seems to work quite well. Stefan Bruckner and M. Eduard Gröller – This paper proposes a novel way to integrate along the ray in the volume rendering process. The idea is very unique and provides excellent results. Since techniques such as MIP, DVR are part of every volume rendering course, seeing such novel and interesting techniques is always exciting. Jonathan Woodring, Han-Wei Shen – Time-varying data visualization is always challenging due to the large amounts of data that needs to be visualized. The authors propose a clustering and sequencing based technique to generate ‘semi-automatic’ transfer functions for the data. Mathias Schott, Vincent Pegoraro, Charles Hansen, Kévin Boulanger, Kadi Bouatouch – I enjoyed reading this paper a lot since people rarely seem to talk about anything other than ambient occlusion these days. This paper presents an elegant and unique way to provide occlusion shading with reasonable frame rates. Looking forward to implementing this soon. Niels Willems, Huub van de Wetering, Jarke J. van Wijk – This paper provides a very beautiful solution to the problem of visualizing vessels coming in and out of a port. I enjoy reading J. J. van Wijk’s papers and this and the next one are not any different. Danny Holten, Jarke J. van Wijk – The authors follow up on the excellent paper from IEEE Vis 2005 on ‘Hierarchical Edge Bundles: Visualization of Adjacency Relations in Hierarchical Data‘ (which was mentioned in one of my previous posts on Seminal infovis papers), with another great paper. This paper has already received a lot of attention here, here and here. Here is a screenshot showing migration patters in the united states.